I realise I didn't show you my glass class progress last week, I remembered this morning as I was putting my glass box in my car. The thing is... I only have 3 little leaves to show you. I had also made another fused piece, but the lady at the studio accidentally slumped it! I'm hoping to get it back, unslumped, tonight and I can show you that piece, the leaves and the stem which I finished last week and left to be fired. Thinking about this rather large work-in-progress (my glass window... I'm not sure if that train of thought carried out of my brain onto the keyboard or if you'd all be sitting there wondering what I'm waffling about now) led me to think about all the other work in progresses hanging around. I really need to get some of them done as they're stressing me out a bit. I don't even know why. Why should a half-finished doily bother me so much? Anyway. I decided to share. I know you've all been going crazy wondering exactly what is on my WIP list and so I thought it was about time I put you out of your misery. I know. I'm good like that. 1. 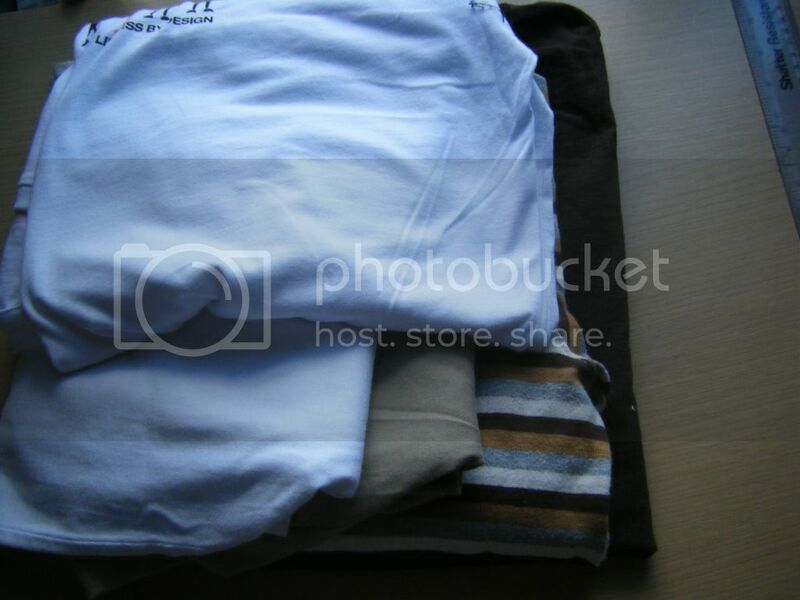 5 more babygrows for Jacob out of my brother's t-shirts. Not technically a WIP as I haven't started... but I said I'd do it and I have the pattern cut out. I'd better not much that one up! 2. The granny square bathroom curtain. I'm going for 3 blocks of each of the 4 colours. That makes 12. I think I only need 9. I have plans for the others if they're not needed. 3. These tea wallets have been languishing in my craft room, almost finished, since the day before Mother's Day. They were to be Mother's Day presents, but I messed up the binding on one of them trying to sew it on by machine both front and back. It has to come off and both bindings have to be hand sewn. I knew I wouldn't get it done in time so it got shunted. 4. 5. 6. 7. Not technically WIPs again as I haven't started them, but they're at the top of my to-do list (meaning I'll get another 85 projects done before I get to these!). The Joel Dewberry herringbone is for a pattern in the bottom book, dungarees for Jacob. 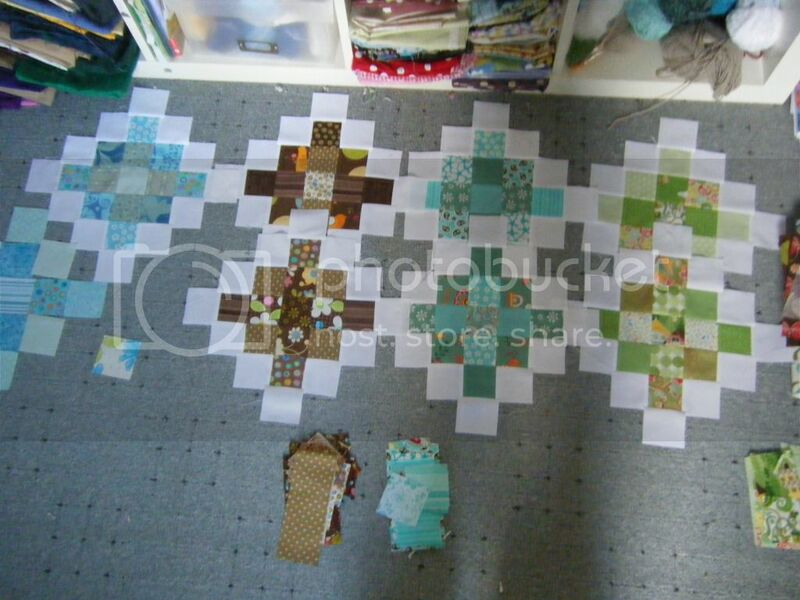 There's something I want to make from Pretty Little Projects, can't remember what it is right now.. a potholder? 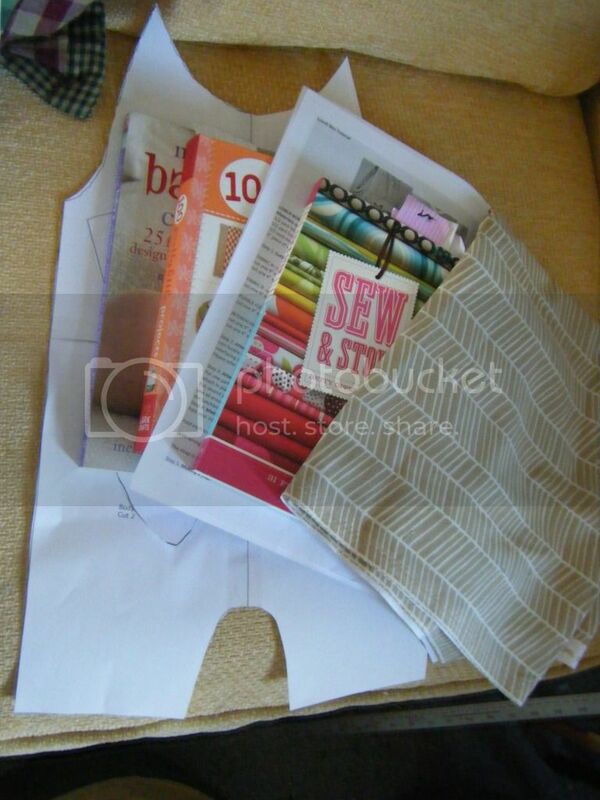 Then there's a lunchbag tutorial I've printed out and I can see two marked projects in Sew and Stow. Wonder what they are?! 8. My project for my Something Old, Something New competition. 9. I last mentioned my giant granny way back in September when I was on round 36. I hadn't touched it since then until the weekend when I had it as my in-car project. I've now completed round 45! It's no where near finished though, it's too small! 10. 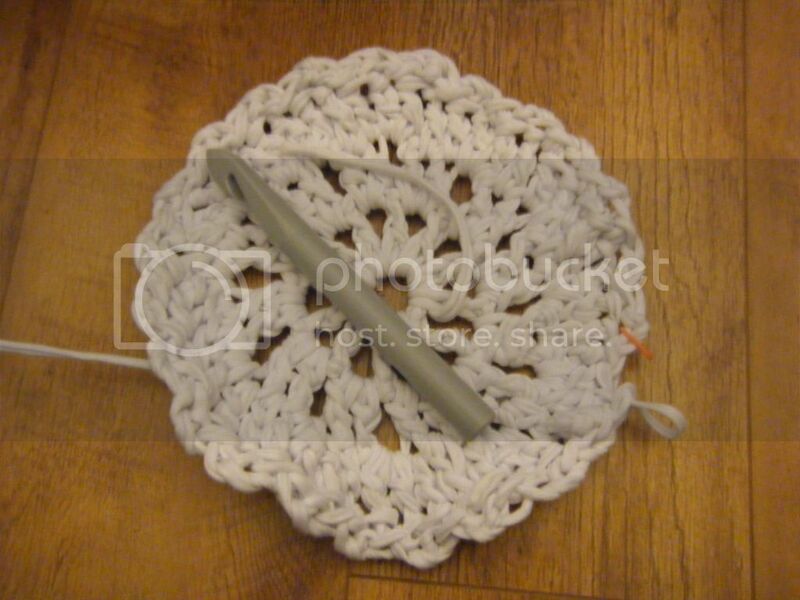 Another crochet project I haven't mentioned in a while is my giant doily rug. I got quite far, then put it aside to work on something else and when I came back to it I had no idea what I was doing! The pattern I used was only for 10 rounds but I'd carried it on. I intend to do the same things again. Yes, I did have to rip it back to the very first round! 11. 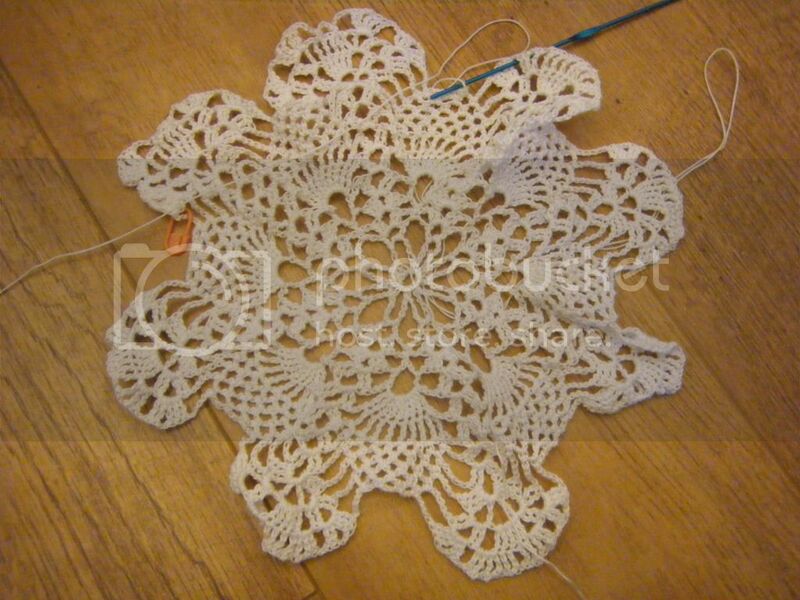 So far I've frogged and recrocheted every single round of this doily. 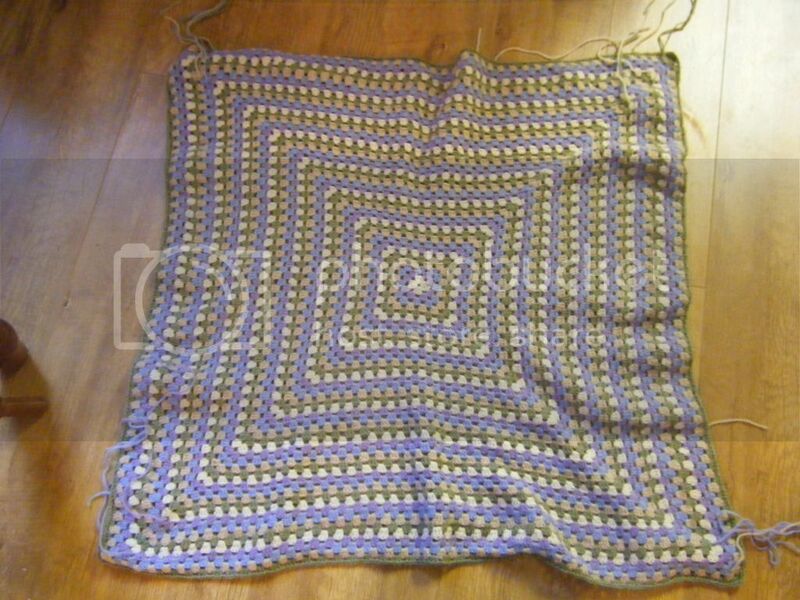 I'm not sure why it's still languishing as I love crocheting it. When I look back on my evenings of the last month or so, I don't seem to have done much crafting at all. I hate being too busy! 12. 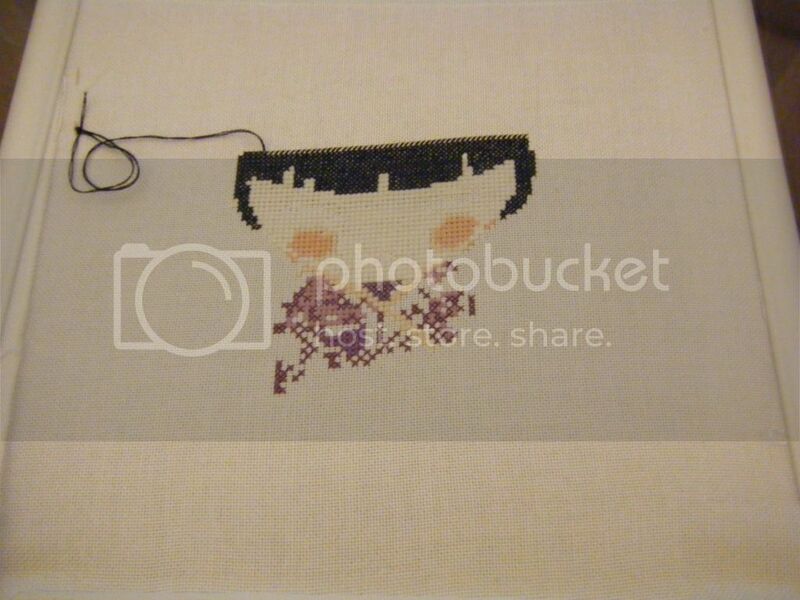 The one thing I have been working on is this cross stitch. 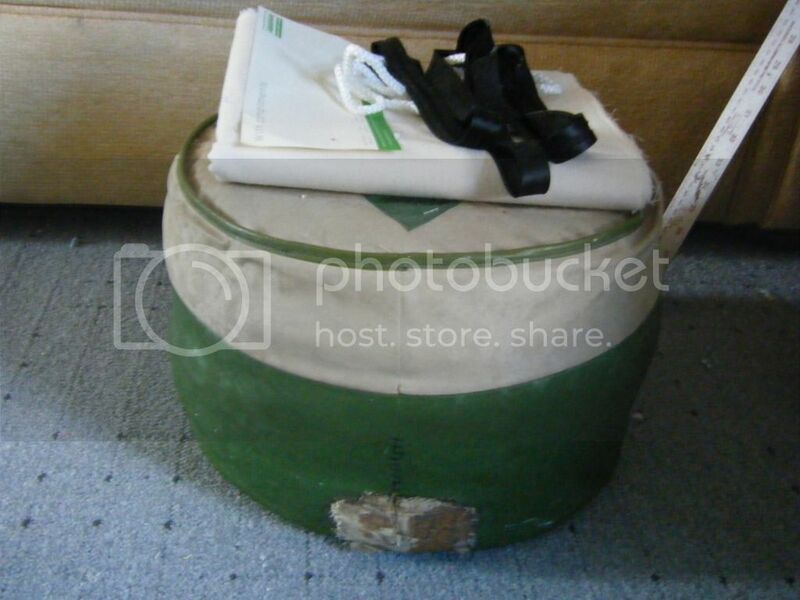 I showed you this a couple of weeks ago and asked if you could guess what it was. You couldn't. Or perhaps didn't want to. That's fine! I hope you can tell what it is now though? It's a pattern I'm testing for Beverly who sells her amazing cross stitch patterns, though I can't find a link to her shop on her blog - Beverly! I'm hoping to get it finished soon. It's been worked on a lot as I've been getting home so late and I'm so tired that cross stitch is the only thing I can do. 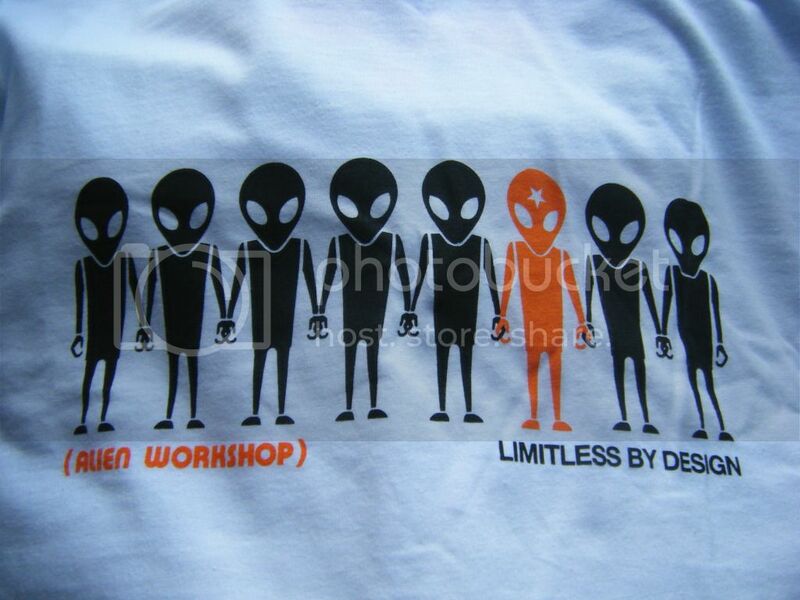 12 WIPs isn't bad at all, is it? Well, it wouldn't be but I actually have a lot more than that... they just managed to escape the camera this time! I'm hoping to get back into regular crafting again very soon, and I've also got a selection of craft courses to look forward to. I'll tell you all about them later this week. Don't forget to enter my Something Old, Something New competition. The deadline is 31st July and there is a prize! I have no idea what happens when you are slumped but it sounds painful! How do you keep track of so many projects on the go at the one time? Wish I could crochet. The doily is so intricate... beautiful!!! I can relate to everything! Just started a new project to-day. Its raining so why not? Wow, Wendy, you have so many amazing projects to complete! I love the quilt. I just took a fabric collage class last week--had so much fun working with different fabrics! 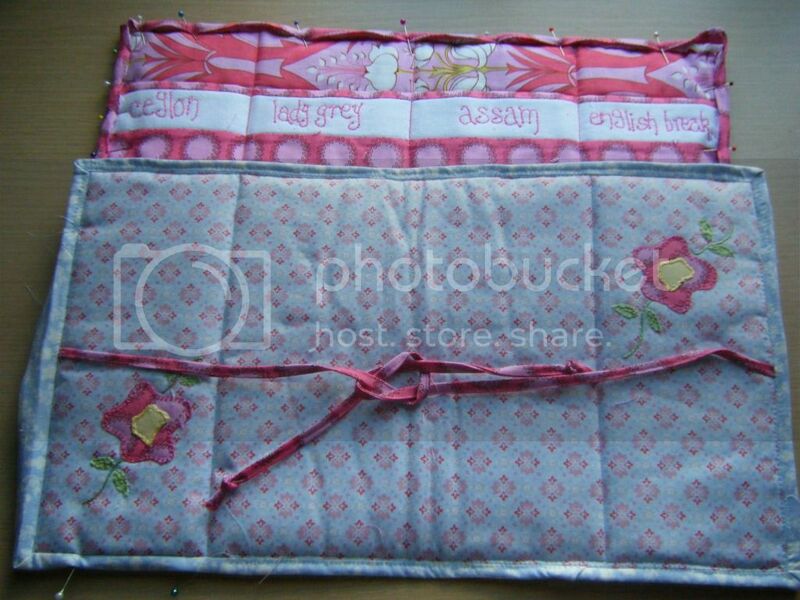 Would love to learn other quilting technics too. Hi Wendy, just wanted to let you know that they've just contacted me about the Christmas Craft fair at the Riverbank & Tom Browns (Gunthorpe) if you were interested. I did the Riverbank one last year it was quite good. Yep....I have a ton of projects partially completed too, and others planned! so many lovely projects... I also seem to have a lot in progress... the biggest decision is what to start on first!!! so then I usually just go and start a new one! I hate when life gets too busy to craft! Your quilted curtain is so nice. It is going to be gorgeous! If you're going to be a Crafter's Apprentice, you're going to have WIPs - you might just as well face it now. My advice, which given the # of my WIPs may not be at all good advice, is that finishing is highly over-rated!